CSG Snapshot: Dollar Tree Stores, Inc. 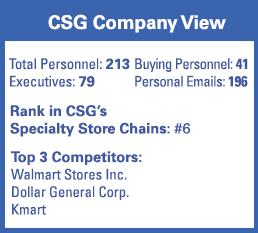 Following the acquisition of Family Dollar, Dollar Tree Stores, Inc. surpassed Dollar General in total stores and total revenue, moving to 6th in CSG’s Database of Discount Stores and Specialty Retailers. The move undoubtedly played a significant role in the formulation of Dollar General’s growth plans that we detailed in the April 26th CSG Discount and Specialty Store Exclusive. Moving forward in 2016, Dollar Tree Stores, Inc. will concentrate on rebranding within their store portfolio – all 220 Deal stores as Dollar Trees and 100 Family Dollar locations as Dollar Trees (adding to the 200 Family Dollar stores rebranded in 2015). In addition, the company will build approximately 550 new stores. CSG forecasts that the new building initiative will keep Dollar Tree Stores, Inc. ahead of Dollar General in total store counts at the close of the year, but the gap will narrow with both companies turning to footprint growth as one plank in their competitive platforms. Historical Data Source: Chain Store Guide’s 2016 Discount Stores & Specialty Retailers Database. 2015 figure includes acquisition of Family Dollar. *CSG estimated growth. Actual figures are subject to change. This data is not intended for investment decisions.